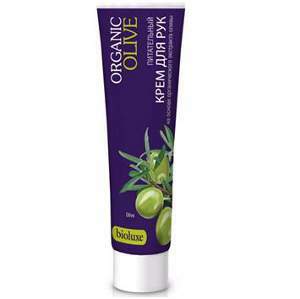 Organic Olive Nourishing Hand Cream is produced by the Russian beauty brand Bioluxe. The product is formulated with organic olive oil. It is designed to nourish your skin and provide it with vitamins (especially vitamin E). This cream is a real salvation for your hands! It makes the skin noticeably softer and smoother, moisturises and nourishes it. The cream contains olive oil. Olive oil is widely used as a cosmetic ingredient due to the high content of essential fatty acids (oleic acid, linoleic acid, palmitic acid) and tocopherol (vitamin E). Thanks to this ingredient, the product takes gentle yet effective care of your hands, softens the skin, provides it with vitamins and other nutrients, prevents dehydration. Bioluxe hand cream is packaged in compact 40 ml tubes which makes it very convenient for home use and for use during business trips and travel, because it is easy to fit even in a small handbag. The cream has one more advantage. It doesn't cost much, and effective hand care has never been so affordable! Directions. Apply onto clean, dry skin and massage until completely absorbed. Ingredients. Aqua, Cetearyl Alcohol, Stearic Acid, Isopropyl Palmitate, Helianthus Annuus Seed Oil, Elaeis Guineensis Kernel Oil, Olea Europaea Fruit Oil, Glycerin, Potassium Hydroxide, Parfum, Benzyl Alcohol, Benzoic Acid, Sorbic Acid. Want to buy Organic Olive Nourishing Hand Cream? Call us or submit your order via our web site! Bioluxe (sometimes also spelled as Biolux) is a professional cosmetic series produced by the Russian company “Pervoe Reshenie” (First Solutions). The series comprises face, hand and foot care products formulated with organic herbal extracts and natural vegetable and essential oils. All Bioluxe creams are free from potentially allergenic or harmful ingredients such as parabens, silicones, mineral oils, synthetic dyes and fragrances. Bioluxe cosmetics are designed for effective and delicate care for your face and body, they are suitable even for very sensitive skin. These creams make the skin incredibly soft and silky smooth, nourish, moisturise and protect it, improve skin elasticity, cope with flaking and prevent dehydration. Due to the high content of natural ingredients, Bioluxe creams are both effective and completely safe for your health. They contain a wide range of plant extracts and oils such as olive oil, chamomile extract, calendula extract, aloe vera extract, avocado oil, green tea extract, magnolia extract, arnica extract, cedar oil, peppermint oil, lemon oil which help them to provide a noticeable long-term effect. In addition, each cream is packed in a compact tube which doesn't take up much space.